When Tabitha Yeager now approaches the entry of Dighton Rehoboth Regional High School in North Dighton, Massachusetts, it’s hard to imagine that it was once bland, boring lawn space. But it was she and her Environmental Technology and Sustainability students who created a practical sanctuary to be proud of. “My school has a lot of potential for growth in terms of sustainability and green projects,” she says. Look around and you’ll see what makes up the school’s Culinary Garden and Outdoor Classroom. A series of flower beds spills over with purple coneflowers and black-eyed Susans, where butterflies pause. Raised beds for produce and trees include strawberries and rhubarb. A wooden composting structure stands neatly against the school building’s wall. A handmade stone spiral planter for perennial herbs is “doing beautifully,” Yeager says. And there’s a new area for outdoor class meetings. 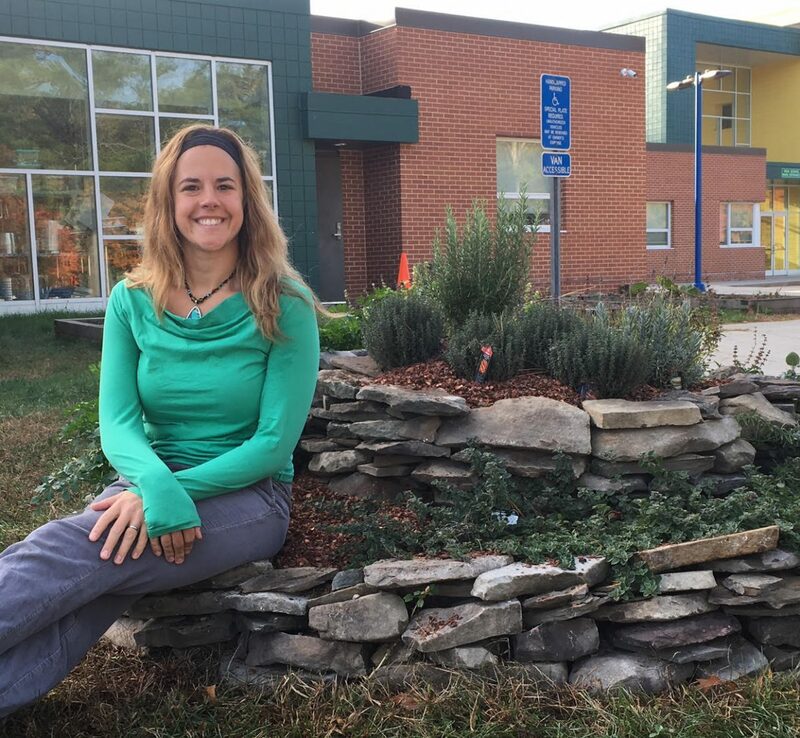 Yeager is one of 22 EcoRise teachers in the Boston area. She began collaborating with EcoRise Youth Innovations in fall 2015 as a teacher and a developer of the LEED Prep curriculum. But for her students, this all began with a Public Space Audit. 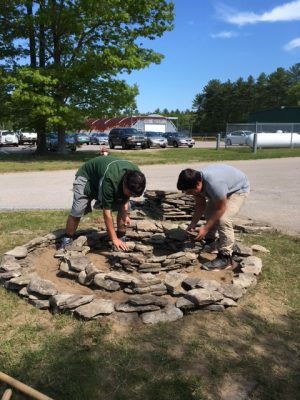 With an EcoRise Student Innovation micro-grant, Yeager’s students had all kinds of ideas for what to do to improve the space: rain gardens, greenhouses, permeable walkways, a trail system. But in the end, it became a collaborative project beyond Environmental Science. What dreams can come true on a $1,500 grant budget? Quite a few, Yeager’s fourteen students found. Armed with shovels, stones, slats and seedlings, they descended on the tiny stretch of space and added new dimension. 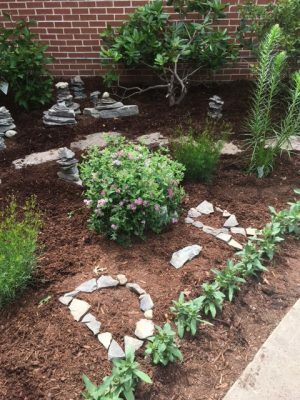 From planting diverse vegetation to the addition of the stone initials “D-R” for a stamp of school spirit, the students took away lessons on companion planting, wildlife-benefiting species, and teamwork. Yeager has come a long way in bringing sustainability education to action since she was a student herself at the University of Massachusetts Amherst. The things she’s teaching her students now had once come alive for her too, in an elective called Introduction to Sustainability. Yeager explains that the kids will come up with small, medium, and large projects under one of five topics: Water & Energy, Community Awareness & Outreach, Sustainable Food, Sustainable Sites, and Waste Reduction. She takes the power of student direction seriously. And she’s thinking even bigger than that. Want to support student sustainability projects in classes like Tabitha’s? Click here to donate to EcoRise’s Student Innovation Fund and be part of a bright green future!